With the increasingly international nature of business, the U.S. Department of Justice is keeping its eye on white-collar criminals both within and outside the U.S. White-collar criminal schemes seem to have no bounds. "Email, internet, computer intrusions and spoofing schemes, often originating from beyond our borders, are on the uptick,” said acting Assistant Attorney General Kenneth Blanco, J.D. 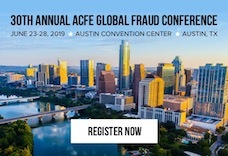 Blanco will discuss the future of the DOJ’s white-collar crime enforcement at the 2017 ACFE Law Enforcement and Government Anti-Fraud Summit in Washington D.C., October 30.